THE WEEKLY B-MOVIE NIGHT BLOG: Half Bad. Half Awesome. All Moon. Half Bad. Half Awesome. All Moon. Plot Synopsis: Full, crescent, quarter...each is a Bad Moon for Ted Harrison. By day, he's a photojournalist visiting family in the Pacific Northwest. By night, he transfigures into a horrific half-human -- a werewolf. Dead men tell no tales, so Ted's sure he alone knows about his vile double life. The secret, however, may be out. The family dog Thor, devoted to defending the household, has his suspicions. -Bad moon is based on the novel "Thor" by Wayne Smith, which tells the story from the family dog's viewpoint. 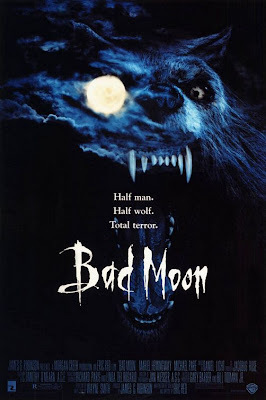 -A personal note: Despite its awesome cheesiness Bad Moon is still one of my favorite Werewolf movies of all time. Not that there's a lot of competition in the genre, but for a lower-budget movie it manages to showcase one of the best werewolf costumes in film... and one of the WORST transformation sequences. Plus, cheesy acting, decent gore, annoying kid-- it covers ALL the bases, for my money. But decide for yourself! Attendees: Mike, Robert, Ryan, Tim. The best character (and best actor) in the film was the star and hero, Thor. By demonstrating simple common sense and basic competence at doing what he was trying to do, he outclassed all the humans in the cast. Distrusting of salesmen, fearless in the face of werewolves and easily startled by birds. 8. German Shepherds hate briefcases unless they remain closed. 7. Forestry surveying is best done late at night. 6. Living in a filthy trailer in the woods and acting weird & crazy will put you above suspicion in murder investigations. 5. Werewolves invariably own huge, ancient leather-bound tomes on werewolves. 4. "I go jogging every night for 9 hours, don't follow me" is a reasonable excuse to cover werewolfing activities. 3. The idea of needing silver bullets to kill werewolves is silly. The idea of people turning into werewolves is not. 2. Lawyers live in the middle of nowhere, don't do anything or go places.